Alyce Thornycroft was the sitter’s eldest surviving daughter and a professional painter and sculptor who exhibited at the Royal Academy from 1864. This is one of four recorded portraits of her mother (see ‘All known portraits’), the first being that exhibited at the RA 1872 (976), , the second being an oil portrait from 1885, and the third being that at the RA 1890 (2000, ‘My mother; bust’), probably similar to the present work but in marble. One of these portraits was shown at the Victorian Era Exhibition, London, in 1897. 1) Baptized ‘Mary Alyce’, she later reversed the names, and was generally known as Alyce. 2) ‘Mrs Thornycroft by Miss Alyn [sic] Mary Thornycroft, sculptor and painter, 21 Wilton Place’; the medium is not recorded but the exhibit number indicates it fell into the sculpture section. 3) Siegfried Sassoon, The Old Century and Seven More Years, London, 1938, pp.27–8. 4) Letter from Elfrida Manning to Barbara Kay, 1958, NPG RP 4065. The bust was accepted by the Trustees on 26 June 1958 and on 7 Aug. Mrs Manning stated that the work should be recorded as ‘Given by her granddaughter Mrs. W.O. Manning’. Bust, wearing scarf or veil on back of head. The artist, her brother Hamo, his widow Agatha, her daughter Mrs W.O. (Elfrida) Manning, by whom presented 1958. 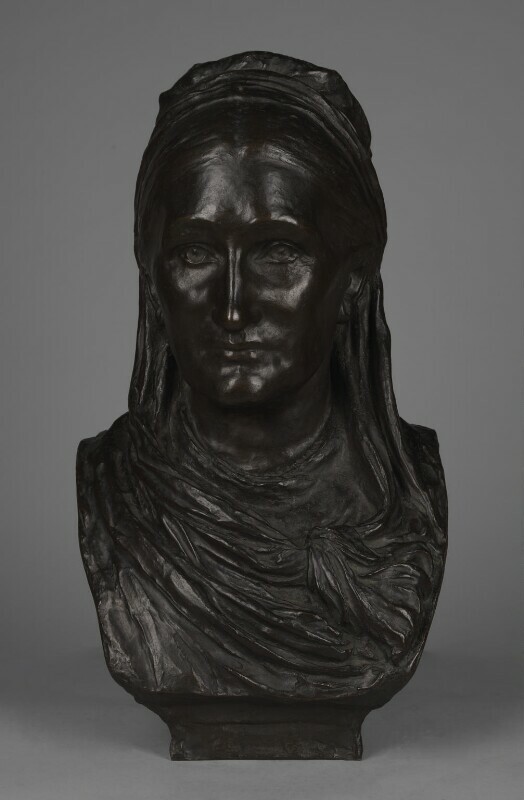 RA 1892 (1899, as ‘My mother; bronze’). Possibly also shown at the Victorian Era Exhibition (Women’s Work), London 1897 (97, as ‘the late Mrs Mary Thornycroft’).